Posts containing presentations that have been carried out on or about the course. Right well the presentation did not go as planned, I got too nervous, was not prepared and of course did not quite have enough to actually present. Or at least it felt that way. I did however ironically finalise the power-ups when I got home as that was one thing I didn’t manage to iron out while writing the very rough High Concept document. Sketching out buildings and ideas. While thinking about the track placing puzzle aspect I realised that it was adding in a style of game play that I had not previously thoughts about in detail or had researched. It started to make the game more like ‘Pipe Mania’ which is what I was originally trying to avoid. 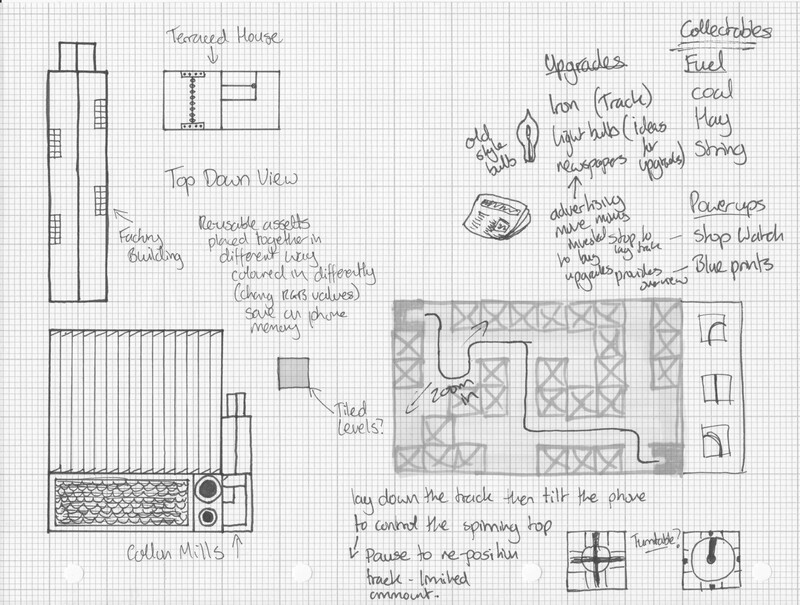 Also I have found that the more I draw on graph paper the more I feel like I am being inspired by ‘Polarium’ a game on the DS that I played a lot when it first came out. Today I presented my game idea to the class, I yet again waited to go last – but this time it was more due to the lack of sleep I had managed to get the night before. Now as I have discovered that in previous presentations that lack of sleep appears to help with the nerves. However it does also imped my ability to talk cohesively at the same time, despite some rather clever note preparation. As I exported the Power Point as a PDF with my notes (as seen below) and transferred that PDF to my HTC phone, the idea being I could use the touch screen to flick through my notes as I went through the presentation so I was sure I covered everything I needed to. However this didn’t quite work as I had not practiced enough beforehand and therefore couldn’t quite get the mouse clicking and the page flicking done at the same time. It felt like I was trying to do the pat your head and rub your tummy at the same time trick while reciting the alphabet backwards.